It's a question people have asked for centuries: What is "dinner music"? When you enjoy a good meal, what sort of music goes best with it? Let's consider the cases strictly where your primary focus during the meal is the food itself and the conversation you're enjoying with any dining companions present. The music, in this case, is supposed to be "in the background," yet still audible and intelligible. So again: What works to compliment your meal, and what doesn't work  because it interferes with your enjoyment of the meal itself? In past centuries, even the most esteemed composers wrote music for such purposes. A Mozart serenade or divertimento, for example, probably would have been originally written for the express purpose of accompanying an evening's social engagement for nobility. Not to pay attention to, mind you  but to enjoy basically "with one ear," while they went about the business of dining or socializing. In our time, restaurants pipe in music for their customers for the same reasons, but the musical selections are hardly ever the result of much thought or preparation. Recently, the esteemed musician and composer Ryuichi Sakamoto made headlines when he approached the proprietor of one of his favorite restaurants in New York to say that, although he loved the food there immensely, the music that was played over the dining room sound system was so bad that he could no longer patronize the establishment. He actually offered to curate the restaurant's dining room playlist, "free of charge," he said, to bring the dinner music more in line with what he thought would cultivate a more agreeable (and, in his mind, appropriate) experience  not just for himself, but for any diner. As news of Sakamoto's unusual offer started to spread, a general conversation about music in restaurants began to take off, as well. Many chimed in with flashes of recognition from similar dining experiences. Indeed, who hasn't at least once sat at a table and wondered, "What kind of thought process went in to picking this stuff?" In Sakamoto's opinion, the answer was, "not a very good one." 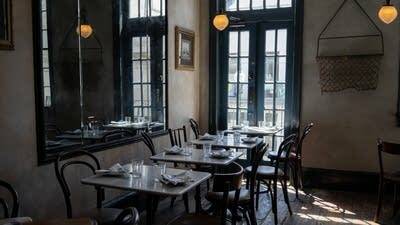 If a restaurateur agonizes over every other detail of his or her establishment, from the sourcing of ingredients to the color of the wallpaper to the shape of the chairs, why does the music so often get left to a playlist on an iPod, dialed up randomly by the host or hostess on the clock for the evening? The playlist Sakamoto ended up delivering was heavily weighted toward more "ambient" works  music that Brian Eno defined more than 30 years ago as designed to be "just as ignorable as it interesting" (although Sakamoto said he wanted to specifically steer clear of Eno's music, due to it's recognizable nature). In so doing, Sakamoto's playlist raises another question about the style and direction of modern art music, and in what cases different types of music are appropriately seen for their "utility." Eno had no qualms about his intellectually constructed music being "ignorable," yet a lot of quiet, minimalist modern fare is sometimes taken less seriously by some academically inclined classical musicians for its lack of complexity or rigor. Ironically, such musicians might happily dismiss such music as the selections on Sakamoto's playlist as "dinner music," but intend it as an epithet. For his part, Sakamoto sees nothing wrong with the idea of finding the right music for dining and losing no respect for said music in the process. Indeed, humans have done it for centuries.